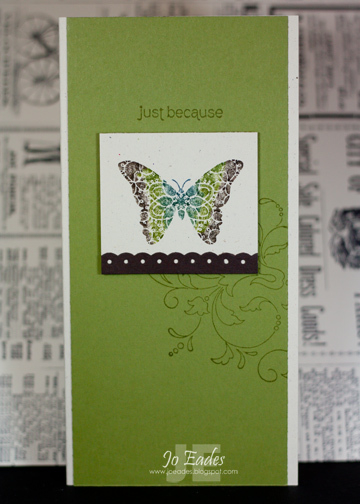 As promised, just a 'few' weeks ago now, here is another of the Make & Takes we did at the 2011 Stampin' Up! Convention. Mine is a little different to most as the sample card had the Old Olive cardstock crimped and distressed with Early Espresso ink. Here's where I admit that I'm not really a fan of the 'crimped' look - I think it's because it brings back too many memories of BAD 80's hair and associated fashions. Anyhoo, I decided not to crimp and I'm SO glad I did because I just love how this has turned out. I can't remember the exact dimensions of the card, except to say that it fits into the Small Open End Envelopes. Thanks for visiting, I'll be back to show you a card that I entered into the 2011 Papercrafts Gallery Idol competition. I didn't make the cut, which is not suprising since there were SO many fabulous creations, but I love how the card turned out anyway. Gorgeous card Jo, and thank you very much for my Happy Mail Love this sort of mail He. He.